What is a cooler? What are the benefits? The best coolers for camping are a part of the paraphernalia you would need for a pleasant day outdoors. It’s especially important when you intend to bring with your perishables or drinks that are prone to fouling or breaking when faced with the environment. Certainly, there are many types of coolers out there: From the best coolers for professionals to cheaper alternatives for family camping trips. Nonetheless, choosing one out of many to find the best camping cooler for camping is a pretty hard challenge for you. This thorough guide to finding the best coolers for camping might give you a hint on choosing what is right for you! A cooler, in short, is a box made out of insulates materials to keep the temperature inside for a long duration of time. And yes, no matter what the weather is – you can always expect ice-cold air within when opening your cooler if it’s a good one. This box can protect your temperature-sensitive items such as fresh food and drinks from deteriorating in the heat outside. And your cooler also does another job of carrying all of these items in one, neat chest. With this box, there’s no need to lug all of them around in many different cumbersome boxes and bottles. High-End coolers are – accurate to its name – made entirely for the professionals at mind. They are usually employed by hunters, explorers or people who spend weeks outside in the wild. These coolers have the capability of preserving ice for a week or more with top-of-the-line technologies. High-End coolers are usually extremely tough, being made of industrial alloys and can withstand quite a lot of punishments as well. But because of the abilities, they will also require a much more generous investment. These are the coolers for long camping trips with your family and friends. They can keep your things nice and cold for a day or two with some special mechanisms. Of course, this still depends on the models and can handle getting knocked over a bit. They are within the medium price range and are recommended for large families. They’re cheap; recyclable boxes made of foams glued into a plastic shell you can throw away without guilt afterward. You can buy these in bulks without denting your budget too far. However, they can only hold your ice for half a day at most and can easily rip/break when handled forcefully. Each of them has their respective pros and cons, but it all depends on your demands, usage, and frequency of using them. If you’re a passionate camper and will spend your time in the jungles for weeks at a time – you can’t trust disposable coolers. And if you’re heading out into the park with your family during weekends – you can’t invest a fortune in a high-end cooler. Knowing what you need and knowing how you are going to use it will be crucial for deciding the best cooler for camping for you. This one is a no-brainer: The larger the box, the more expensive it will be. And in turn, the more effective the insulation layers of the box are, the more expensive it will be as well. If your party is composed of a large number of people, you would need a medium-large size box to go. Vice versa, if you go solo-camping or were with only one friend, a small – medium size cooler would be a good fit. There’s no point to splurge on space you don’t need. Small: Length: 12 to 18 inches; Width: 11 to 12 inches; Height: 9 to 10 inches. Medium: Length: 20 to 30 inches; Width: 11 to 14 inches; Height: 10 to 11 inches. Large: Length: 30 to 40 inches; Width: 14 to 20 inches; Height: 11 to 15 inches. The same goes with the insulation – this is the part that makes-or-breaks your cooler. You should consider a quality-built cooler if you expect your trip to be longer than three days. For shorter trips, just move to the cheaper, less enduring spectrum of coolers. The cheapest can stand for at least 12 hours. An average cooler can stand for a day to two. The best coolers for camping can keep the temperature for almost a week. Coolers come in many different materials: Fabric, foam to strengthened plastic. And they each aim at different audiences just like other aspects of the cooler. Fabric coolers should only be an option for a one-day trip and are not made for protection at all. You can easily break the contents within with a drop and water can infiltrate the bag if it’s not under a roof. Foam boxes are not made to be treated roughly – or they’ll make you miserable for it. Even with a slight drop, they can be deformed, or part of them can chip off ruining the insulation, making the box useless. Therefore, consider this very carefully when you’re choosing a foam box. Foam boxes, depending on the type and thickness of the foam, can also be a pretty bad water insulator. If it’s dropped into mud or puddles, there’s a pretty higher chance that the contents inside are ruined compared to other types of coolers. Plastic boxes are much stronger than the rest. Plastic is relatively malleable so they can form dents and cracks after a certain amount of abuse for budget coolers. They’re better at water resisting too and can do a pretty good job sealing the contents from rain water or puddles if latched tight. Besides, high-end coolers are made from strengthened, thick plastic exoskeleton that does a very good job at holding the integrity of the box. For latches, some are made of plastic while much more expensive versions utilize metal to form almost indestructible latches. All coolers come with foldable handles to carry easily; some are even installed with wheels to give maximize comfort and transportability. Many coolers also have additional features such as tie-down points for strapping them down to boats, trucks or planes’ floor. But in the end, the larger your cooler, the more troubles you would have lugging it around. Thus, be mindful of taking an oversized cooler into primordial jungles with thick undergrowth and large branches. The box might have details to alleviate the pain of carrying it around, but it ultimately boils down to where you’re going with the cooler. Be smart about this, and you’ll be cut a lot of slacks. One of the things you should look for is whether it’s convenient to drain or not. No matter how good your cooler is, the ice within will melt eventually. The water within sometimes can be a struggle to drain out without making a mess. Some coolers come pre-equipped with drain ports to allow convenient drainage with a water hose. Other than that, the lid of some coolers can also be installed with baskets to protect smaller and more fragile items during transport. Most coolers shut themselves either with latches or zippers. Latches sometimes can be very easily and effortlessly open while some other times, they can be a challenge to bulge. Zippers are much more familiar and convenient than latches. However, they can get stuck, and the water can easily infiltrate through the gaps. The lid can be pretty heavy to open for some models, but they’re mostly not too heavy to be a bother. Now that we know what we’re looking for, we should dive into the markets. The Esky Series of Coleman for a long time has been the go-to product for outdoorsmen in the U.S. Its rugged structure, and the designer’s attention to rigidness make the Esky some of the strongest cooler available on the market. The latches are made of rubber, and the bottom of the cooler also has rubber patches. That’s why the cooler is immune to slippage if set on a wet surface. This small feature makes the Esky an invaluable cooler for fishermen. However, the rubber patches are extremely tough and hard to open. The Esky has an extremely thick insulation layer and a tight gasket to hold in every ounce of cold air internally. The innards of the cooler are also anti-microbial which is important when you want it to preserve raw food inside. It also has two drains for convenient drainage of the water inside. Besides, the Esky has a fish ruler, dry goods basket and rope handles to fit comfortably on a boat. Furthermore, the cooler also has a built-in chopping board on the lid to process your food on the go. For its insulation’s effectiveness, the Esky can preserve ice for up to 8 days continuously. This set it on a much higher bar than any standard coolers on the market. Relatively heavy – 13 pounds. Tough, hard to operate rubber latches. The Esky is an extremely rough cooler that’s dedicated entirely to solidity and a product of the higher price range. It’s not fit for families or casual users. Instead, its purpose is to fulfill the needs of fishermen, hunters, and days-long campers. The Esky should not be bought for such a price tag if it’s not going to be put through the extremes. The ORCA Cooler has the largest dimension out of the five coolers, and it is also one of the best. The ORCA’s 4-day ice retaining capability will make due for quite a lot of people during a week-long trip. Not made for strength, but the ORCA can also hold itself with a thick plastic shell to protect against short drops, shakes, and high temperature. The seals are made extremely tight to prevent leakage or infiltration, and it does its job pretty well. Although without the glitz and glamor of the Esky and made completely bare, the ORCA has fulfilled its purpose successfully for its price range. The ORCA, a utilitarian cooler, is significantly cheaper and lays at the lower price spectrum for its class. It is for outdoorsmen with a limited budget and at the same time for anyone who needs a functioning cooler. The ORCA is what you should bring if you’re out to do a lot of hunting, ranging or long camping trips. The Yeti is some of the best-known manufacturers for quality coolers in the U.S. with strong design and awesome performance. It is one of the rugged coolers of the brand, dedicated entirely to withstanding the worst of conditions. Even with rigidity in mind like the Esky, the Yeti’s performance also has an impressive number. 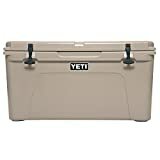 The Yeti has an ice retention capability of up to a week continuously, making it a strong rival for the Esky. Built with patented design that can survive a bear attack, the thick, strengthened plastic shell can fare through a mountain easily. The lock and the hinges are all molded into the structure to prevent hyper-extend past breaking points. Heavy-duty rubber seals keep the lid close tight against everything, and again, including a bear. The product also comes with many built-in features including a good dry basket, rope handless and anchor points. It can easily be seen that the Yeti is also optimized for anglers at mind. The Yeti also features a water drain system. Come with many built-in features. Extremely heavy at 34 pounds. Much more expensive than coolers of the same size. Just like the Esky, the Yeti Tundra’s audiences are chiefly anglers, hunters, and outdoorsmen, much too expensive and heavy for casual usage. The Yeti is the way to go when hiking, fishing and doing anything under the Sun. Unlike the three other coolers, this one is completely different in term of design. Made out of fabric with plastic lining for insulation, this sling bag is built entirely for mobility. To make a cooler small and light enough to wear on their backs comfortably, there has to be a lot of sacrifices to the design. The Coleman Soft Cooler can only retain ice for a day at most, having weaker insulation than dedicated coolers above. It’s also not made for the protection of whatever is inside. Despite having paddings and mesh to give items within a better chance of surviving falls, it’s best to avoid any rough handling. Anti-microbial, odor and mildew, this cooler can also be made to carry raw foods with no problems. Is, at heart, a fully functioning bag, the Coleman Soft Cooler has multiple zippered pockets for additional storage options. Reasonable ice retaining capability for the price and size. The pretty weak protection offered, much more prone to rip, breakage. This bag is oriented toward picnickers who only go out the door for a short while. It is not made to go for a long time. Also, this product is family-friendly, and it is all you need for spending the weekends in the park. For short trips into the wild, however, this bag will also make due. The AO Cooler, another soft cooler, shares design aspects with the Coleman above, both being insulated sling bags at heart. The AO and Coleman 16-can cooler come very close to each other with the majority of their features the same. Both of them are designed with a canvas outer shell, multiple layers of plastic lining to create an ice retention expectation of 24 hours. The AO also comes with the multitude of pockets the Coleman 16-Can has. One of the advantages the AO has over the Coleman being its unique high-density insulation. Composed of several layers of plastic, it provides effective insulation and certainly will have a longer ice retention time than the Coleman. The difference between them is purely the form of size. The AO Canvas offers four choices of size for the buyer, 12 packs, 24 packs, 36 packs or 48 packs. There are also several color options to boot. All the while, the Coleman only offers one size and four colors. Good insulation for the price and material. Being the twin-in-spirit with the Coleman 16-can, the AO Cooler also satisfies the audience that the Coleman serves. Comprising mostly of picnickers and for short trips, but the AO is also made to carry items for much more people depending on the size. This is the cooler to go for large families. After you’ve had your cooler, it’s also important to know how to store your food and drinks within in the right fashion. Remember that perishables and fresh food need to be kept on the ice to prevent them from getting wet. If your cooler has built-in dry goods basket, fill all of your perishables and fresh within. If not, utilize zip-lock bags and lay them directly on top of the ice. Wet food will rot much faster no matter whether they’re in your cooler or not. Bottled drinks do not need many preparations, just sandwich them in-between the ice, and it will do just fine. Also, consider what type of ice you would have within your cooler. Crushed ice will cool your food and drinks much faster, but solid ice will last much longer. Depending on how long you’re out of the door for, pick one that works best for you. A cooler is a very useful thing to have when you go outdoors. It’s as important as the role of a camping tent. After this guide, it shouldn’t be too hard to find one that works best for you in the future. Each of them has their uniqueness, appeals, and audiences, but remember that it will always boil down to what you need the most. Your personal demand plays a key role in deciding the best one. Therefore, do not go out and buy the best if you have no use for it. And of course, you shouldn’t hesitate on investing in a quality cooler if what you do demand a larger or a stronger box to fit the situation it’s wanted for.